Fall Back! Does Daylight Savings Time Affect Cats? This Sunday, November 4th marks the end of Daylight Saving time. Don’t forget to “fall” your clocks back an hour, and prepare to gain an hour of snuggling time with your furkids! For many of us, this one hour time change takes weeks to adjust to. 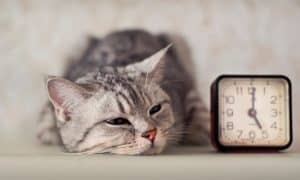 We’re hungry when we shouldn’t be, we can’t seem to wake up in the mornings, too wired to sleep at night… This got us wondering – Does daylight savings time affect our cats? In fact, it does! Cats have circadian rhythms (our body’s biological system of timekeeping, so to speak), just like humans, that regulate sleep, hunger, and activity levels throughout each 24-hour period. In nature, these rhythms are triggered by natural sunlight. But, in our artificial environments, where morning starts with the blaring of an alarm clock and the flip of a lightswitch, our circadian rhythms (and our cats’) are largely self-driven. So, in the same ways that we have to adjust our eating and sleeping patterns and just feel awkward until we get used to it this time each year, our cats will go through it too. Only, we can’t explain the change to them – they just wonder why we’re acting so strangely all of a sudden! To our cats, we’re suddenly feeding them at a different hour than usual, playing with them at an odd time, or even keeping them awake when they’re usually cozied up in their beds (or with us in our beds!). Humans set their pets’ routines, said Alison Holdhus-Small, a research assistant at CSIRO Livestock Industries, an Australia-based research and development organization. This behavior shift could cause animals psychological and physiological stress, Holdhus-Small said. A cow’s udder, for example, will continue to produce milk regardless of how we set our clocks and pressure will build up until the cow is milked. Household pets might get grumpy when they show up to an empty food dish at their perceived dinner time. Bottom line, your cat may need a little paw-holding for the next few days. If your cat seems especially confused or distressed by the time change, try adjusting him to his new schedule in shorter increments – say 10 to 15 minutes a day – for a few days, rather than switching his schedule by a full hour all at once. The good news is that cats are resilient and will adjust to the change quickly. So, yes, our cats are affected by daylight savings, but they’ll adjust to it just fine every year, just like we do. Spring Forward! Does Daylight Savings Time Affect Cats?